↑ "Indian subcontinent". 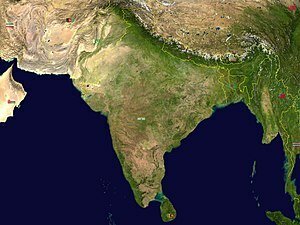 New Oxford Dictionary of English (ISBN 0-19-860441-6) New York: Oxford University Press, 2001; p. 929: "the part of Asia south of the Himalayas which forms a peninsula extending into the Indian Ocean, between the Arabian Sea and the Bay of Bengal. Historically forming the whole territory of Greater India, the region is now divided into three countries named Bangladesh, India and Pakistan." หน้านี้แก้ไขล่าสุดเมื่อวันที่ 18 กุมภาพันธ์ 2562 เวลา 20:51 น.